I like to entertain. Actually, when filing out the eHarmony personality profile years ago, “likes to entertain” was one of the things that found Rob and I compatible. In Oregon, with the close proximity of everyone in our neighborhood (well, really it was the close proximity of the width of the peninsula – there weren’t many miles to go before hitting water on either side! ), we would entertain all the time. Big, late-into-the-night parties, simple girls’ nights, football get-togethers, I think once we may have even celebrated Groundhogs Day. Hey, it’s an American holiday, right? Since moving to Jacksonville, we haven’t entertained as much. The deployments are constant, the distance from one end of Jacksonville to the other is over an hours’ drive, and we happen to live in the “country.” Which, I love, but it does make the trek out here a little long. But enough was enough. It was time for a girls’ night. After inviting a group of friends over, I was in the full get-together swing of things. The morning of the party started a little rocky with my homemade almond butter ending up on the ceiling (that little blender stopper dohicky thing is important), but the house was already decorated for the season, so the only thing left for décor was ironing napkins. Easy. For the menu, I kept true to my roots; seasonal is always best. The weather has just started to change in JAX, exhibiting an autumnal breeze cool enough to notice there isn’t sweat running down my thighs for the first time in months. So I thought a healthy comfort food meal would be perfect: white bean dip with cast iron nuts and stuffed bacon-wrapped dates for appetizers, and spaghetti squash with a veg ragu accompanied by a green bean, leek and apricot succotash as the main. The girls were generously bringing wine and dessert, so we were all set. 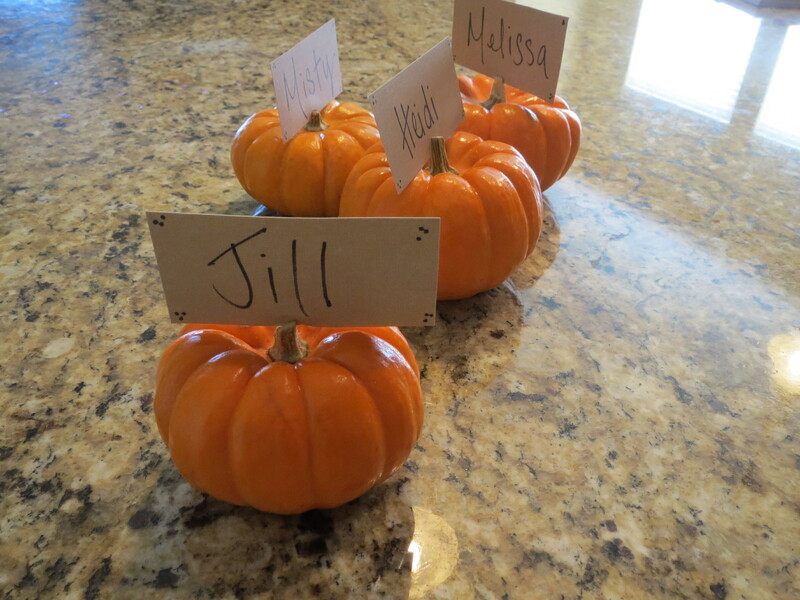 Martha and Ina would have been proud of my table (yay for pumpkin name plates! ), and the dinner just smelled delicious. Everything was planned out swimmingly until, 5 minutes before the guests arrive, I freak out. Remembering that two of the girls coming were following a general Paleo diet, my gasp was audible. Here I am, with my veg-inspired background not at all following rule #1 of entertaining: serve what will make your guests feel special. AH! Paleo is meat-based, and the pepitas on my ragu isn’t going to cut it! Is there time to stuff a chicken in the oven? No…. Can I throw some salami on the squash? Hardly. With the doorbell ringing, I prayed to the veggie Gods for help, and the protein Gods for clemency. My freak-out, like honestly most freak-outs, was just plain silly. We had such a good time, and the ladies loved the meal. Better than any food or wine that night was the amazing company and the growing of friendships. Which is truly the reason for any entertaining. We all had a lot in common and were able to share some pretty funny military wife stories. No boys allowed. The Paleo diet did come up though, and after we said our goodbyes, I decided to do a little more research on the topic. So, as I sat in bed, eating a late-night dessert piece of sourdough with butter, I ironically read about the gluten, grain, legume, and dairy-free lifestyle. Through breadcrumbs on my night-shirt and with butter-licked fingers, I learned about the pros and cons of “primal” eating, and it truly inspired me. Being one that focuses eating on a more flexitarian principle, I do experiment with different styles of cooking and eating, as long as it’s whole-food, seasonal, clean eating. So into the Paleo world I dove. Remember the almond butter on the ceiling? 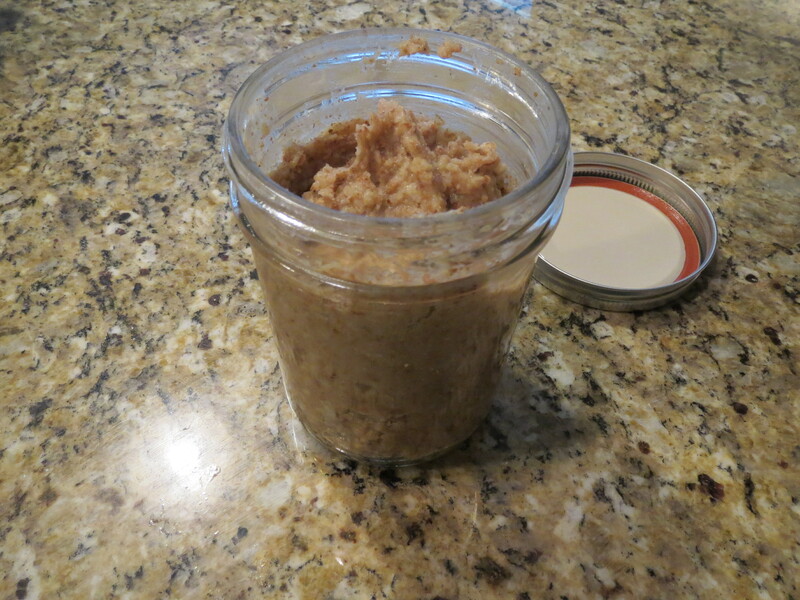 Well, that was a small series of catastrophes that led to me throwing my hands up in the air (as opposed to my blender against the wall) on making homemade almond butter, and settled for almond milk instead. Loving plain almond milk but wanting to spice things up a bit, I let raw almonds, coconut chips, and a touch of maple syrup sit completely covered with water for 24 hours in the fridge. 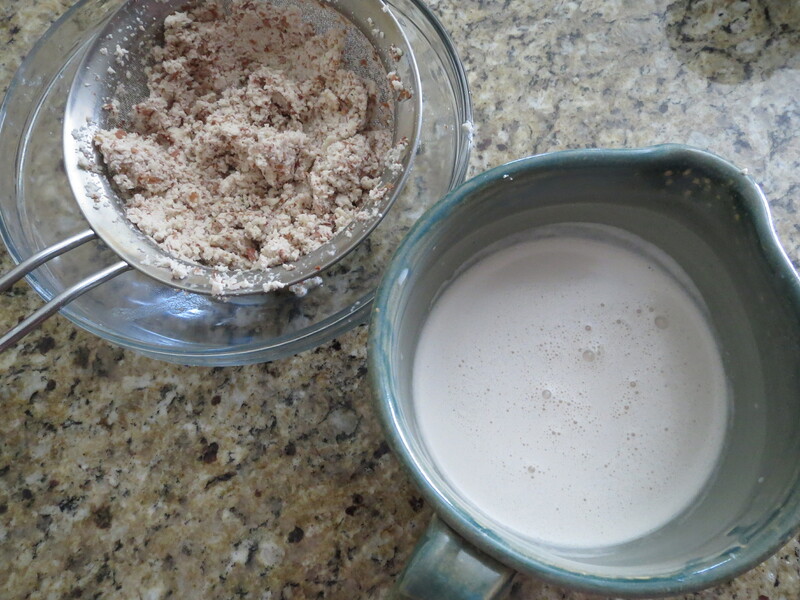 After it was blended and then strained, I was left with a beautiful, slightly naturally sweetened almond milk, and a hearty almond mash. 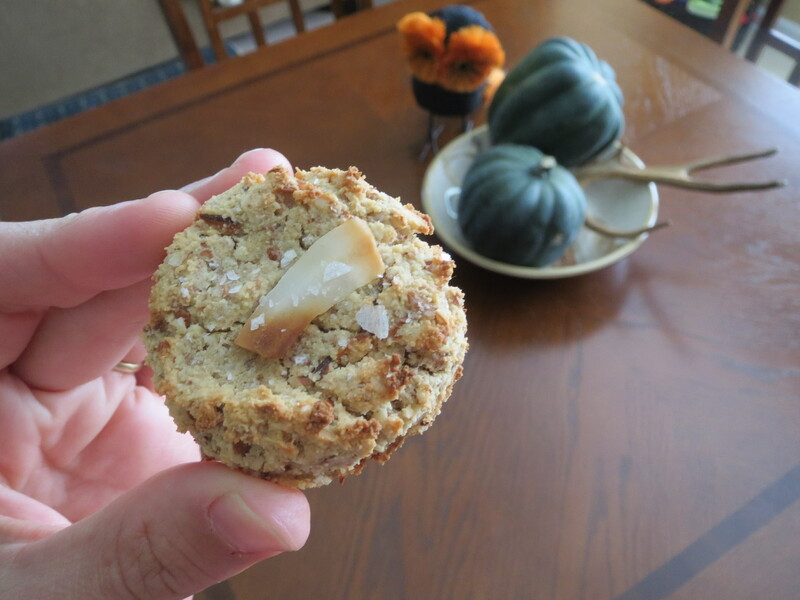 The Paleo inspritation: almond cookies! Similarly to how I use my juicing pulp to make crackers, I couldn’t let the mash go to waste. So mixing in a quick dough of coconut flour, almond butter, a touch of maple syrup and the mash, I whipped up a crunchy and creamy Coconut Almond & Maple cookie that would leave even the biggest sweet tooth none-the-wiser. They are super easy to make, and even easier to eat. Despite the flexitarian diet, the evening was such a blast and I look forward to the next time the girls get together. Only next time, I’ll serve marinated flank steak, and these cookies for dessert! Mix all ingredients together until incorporated, only about a minute. Using spoons, or a small ice cream scoop, spoon onto parchment paper or a silicone mat on a half-sheet pan. Push down to make the cookies even. Top with a sprinkle of sea salt, and *optional: a piece of roasted coconut. Bake until golden brown and crunchy on the outside, and chewy on the inside, about 25 minutes. Let cool, serve, and devour. “I’m So Fancy,” by Iggy Azalea has been stuck in my head for months now. It’s catchy, Jimmy Fallon did an excellent lip-sync of it, but it’s mostly lodged in my brain because I have taken to singing it to every possible circumstance. Almost anything can be used in place of the highly syllabized word “fan-cy,” and I’ve been inserting many, many I’m-so-isms to the tune of that song. Take the summer wreath I made: I’m so craf-ty. Being caught busting a grove: I’m so danc-ing. Dozing off on the couch: I’m so sleep-y. Making a veg ragu that tastes like Bolognese: I’m so sneak-y. Making Watermelon Chipotle Soup: I’m so veg-an. Ok, so I’m not vegan, but I did make an excellent vegan soup. It’s funny (and as you will soon see in the up-and-coming “What I’m Reading” section of the blog), that I happen to read, cook, and use many vegan recipes and ideas. While I am not an avid vegan, I do believe in healthy principals encompassing a diet chocked full of fruit, veg, a bit of grain, and nuts. So as a quick and easy weekend lunch, I whipped up a cold soup, perfected with late-summer flavors. Even my meat-and-potatoes husband loved this soup. 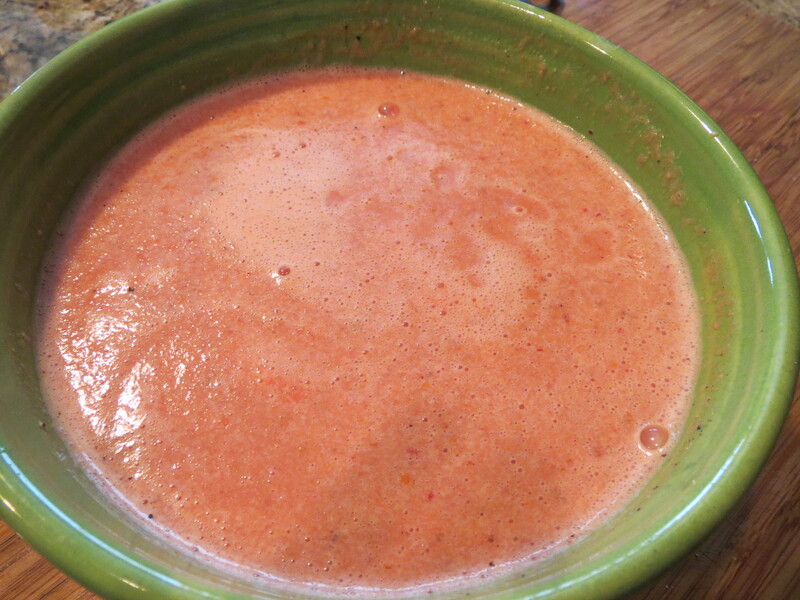 In a blender, I added ½ of a skinned, small seedless watermelon, cubed, 2 chipotle peppers in adobo sauce, ¼ c toasted almonds, 1 small handful of basil leaves, ½ c water, and a pinch of s&p. Whir and blend until all is combined, and, well, soup-like. 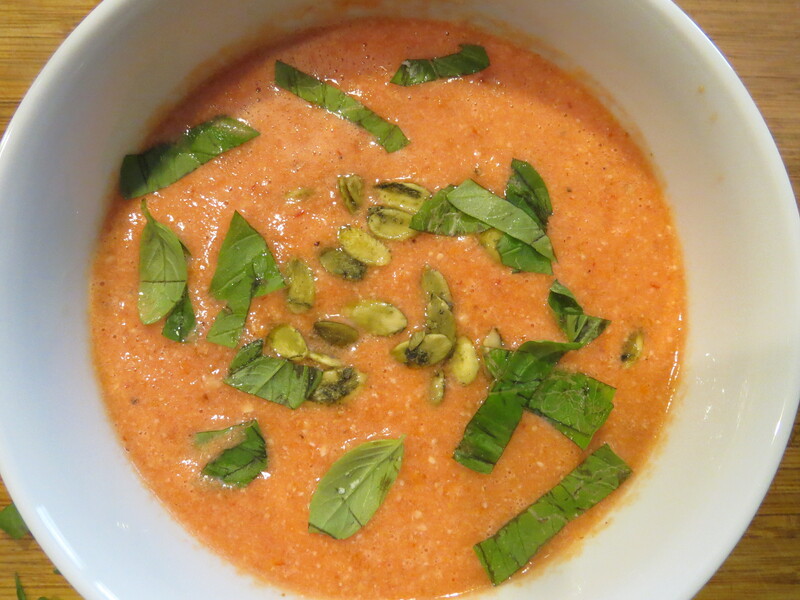 Pour into bowls and top with some more basil and roasted pepita (pumpkin) seeds. Voila: Watermelon Chipotle Soup, veganized! There’s really nothing fancy here. But it’s totally cool to sing how fancy you are serving this summertime soup while entertaining. It’s as simple as that. I’m so fan-cy! Last year at this time, I was blogging 2-3 times a week, happily writing and experimenting with my Turkey Day Trials, and prepping for the best holiday of the year. It was my first Thanksgiving cooking, and my parents were coming up to visit – everything had to be perfect. This year, everything still must be perfect, but I’ve moved up a level in the video game of life, causing more hurdles to jump over and extra-point challenges to face. Rob and I see each other almost every day. But our jobs, while enriching and rewarding, have brought us to a new intensity in limited interaction. Having just entered the Aircraft Commander syllabus, Rob is working even harder and studying whenever possible. My job leaves me, more often than not, wanting to crash out on the couch saving any laundry or other household chores for “another” day. We have been busy with bittersweet traveling (going to North Carolina for Rob’s uncle’s funeral; sad occasion, but nice seeing lots of family), busy with friends (Meghan and Daniel’s trip up from Irvine was a blast! ), and busy being stressed over Oregon’s missed field goal to lose a should-have-won game against USC (urgh). We’ve had some,well, busy times, but I’m certainly not complaining – Rob and I live a very full life. But it all kind of caught up with me yesterday. In my house growing up, Thanksgiving was the biggest holiday we celebrated. We ate, we watched the Macy’s Parade, we ate, we watched the Dog Show, we ate, we watched my mom squeal as my dad de-innarded the turkey, and we ate some more. Last year was pretty much the same, except I was the one de-innarding the turkey, and Rob was the one running after me with 409 to disinfect any poultry germs. But while last year I had time and ability to experiment with pumpkin pie, taste-test three different stuffings, and concoct the best turkey to herb butter ratio, this year has been a bit different. 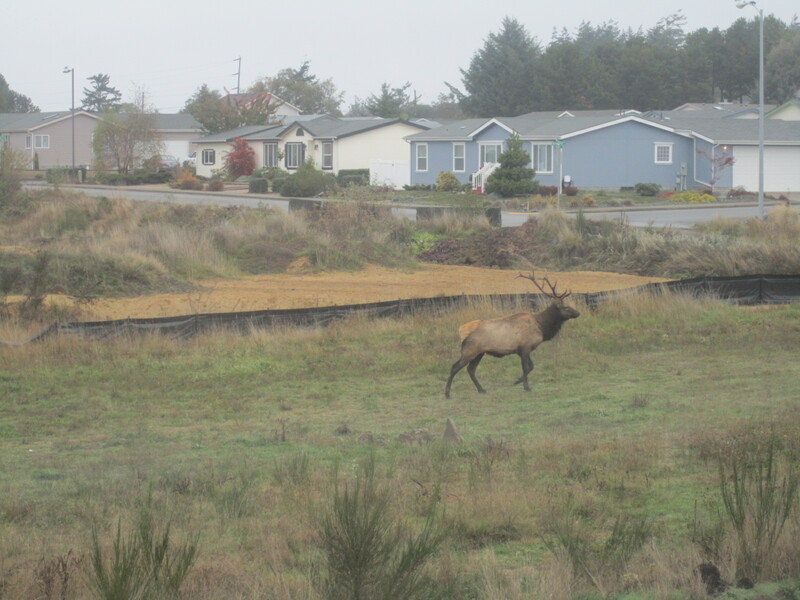 Yesterday, Rob and I went to the grocery store to pick up the final fixins for this year’s meal. We had returned the night prior from the UofO/USC football game feeling drained and exhausted from the expended adrenaline, lack of body warmth, and long drive. I had a list – no, the list – of Thanksgiving necessities (one year, my mom forgot the black olives. My dad still talks about it). We were walking up and down the aisles picking up our loot, when, all of a sudden, all of the to-dos and lack of Thanksgiving preparation that I had been keeping on the back burner, running at a gentle rolling simmer, came rushing to the forefront of my brain reminding me that the BEST day of the year was only 4 days away. And I had not prepped at all. “I…. I….” the panic levels were audibly rising. “What?” his concern was obvious. “Holy Crap I didn’t get to do my turkey trials this year! There’s so much to do! This is the best day of the year and I’m not enjoying it the way I should! And I don’t remember which kind of stuffing I’m supposed to buy!” the verbal vom came out at, what I imagine, was faster and a few pitches higher than normal. Rob could see it starting. I was loosing it. Well, even with all of my grocery store blubbering, it turns out I did get to have a turkey trial this year, even if it wasn’t a planned dish for my family’s Thanksgiving feast. A friend requested a minimal chopping, gluten-free stuffing to enjoy with her family this year. Since I often have secret love-affairs with large amounts of gluten when Rob is on duty, I took this as a challenge. I researched; most gluten free recipes require cubes of gluten-free bread, a food that is difficult to find and can stereotypically be dry, dense, and tasteless. So I improvised and came up with a “crumble” of sorts using corn meal and almond meal. The dish had the stuffing-like texture, and the flavors of Thanksgiving were all incorporated. I called my mom from the grocery store, still sniffling from my “incident” back in aisle 14, confirming the correct stuffing for our dinner (during which time she genuinely asked me if I was 1) okay, and 2) a mental – got to love the east coast mommy!). So needless to say, despite its tastiness, we will be sticking to tradition and not be having a gluten-free stuffing for our holiday. But hopefully my friend and her family will, and enjoy the flavors, and the holiday, without scary gluten allergies. Preheat the oven to 375 degrees, and grease a square baking dish with butter. Melt 3 tbsp of butter in a large sauté pan. 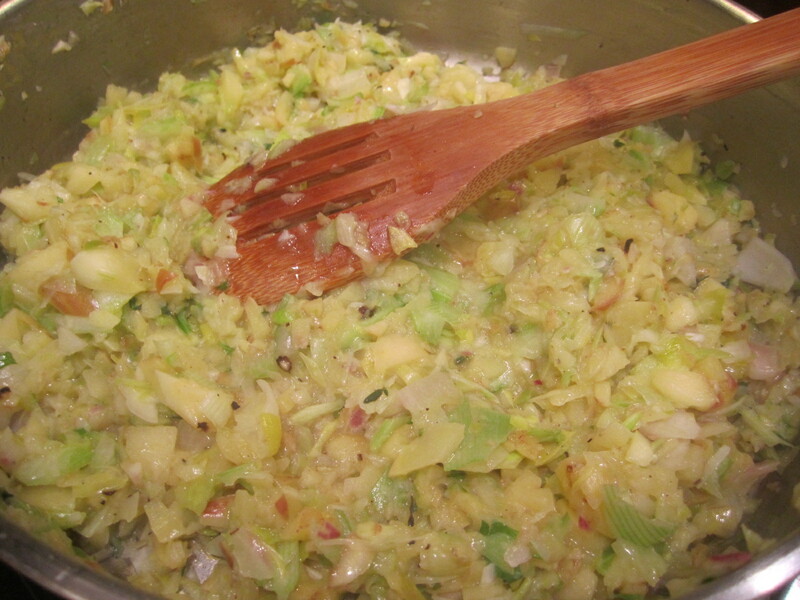 Chop the leek, apple, onion, celery, and potatoes into very large dices (about 2 inches each). Toss into the food processor. Pulse 3-4 times; just enough so the veggies are chopped up, but NOT pureed. 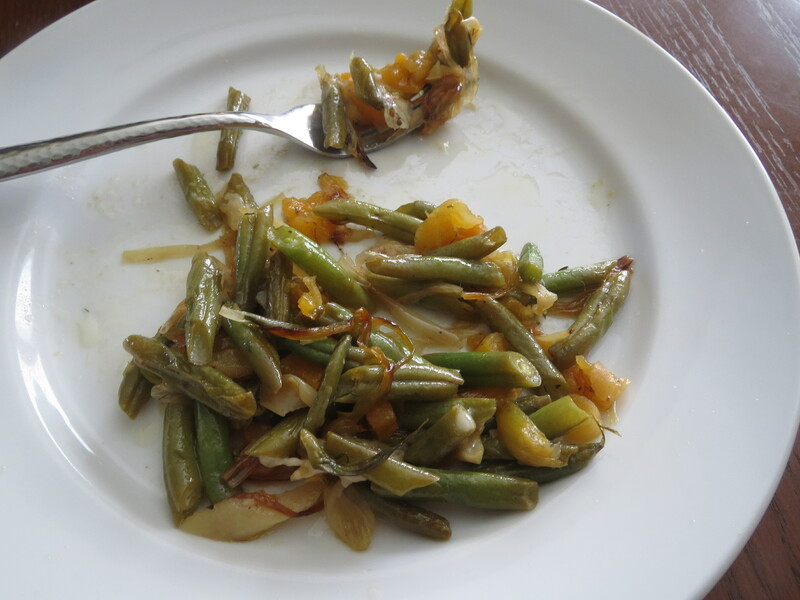 Pour the veg into the sauté pan, and season with s&p to taste. Sprinkle in the thyme leaves and sauté until the veg has softened, but not browned. Add white wine and simmer for a few minutes, then turn the heat to low. Change the blade in the food processor to the dough blade. 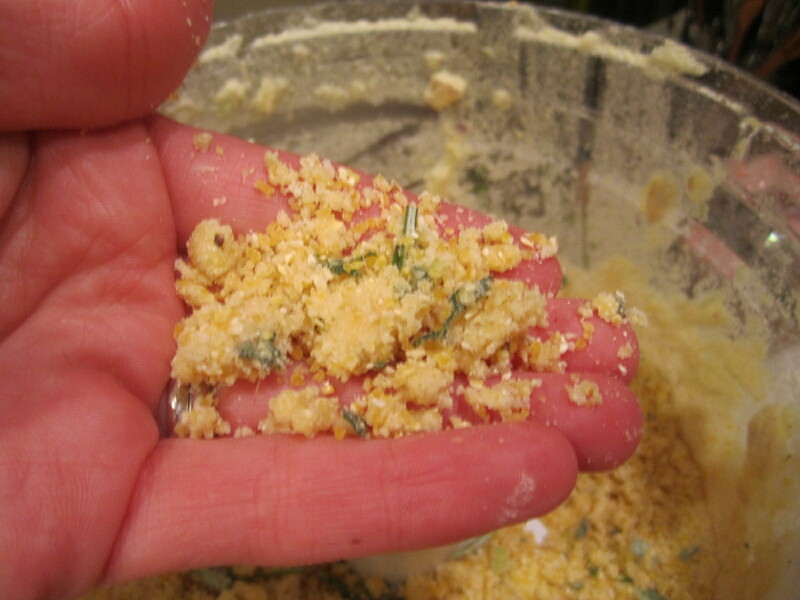 Add in the cornmeal, almond meal, butter (broken up with your fingers), rosemary, and sage. Season with a sprinkle of s&p. Pulse until the mixture comes together like damp, grainy sand. Mix ¾ of the cornmeal mixture with the vegetable mixture, and pour into the baking dish. Using a spatula or the back of a large spoon, even out the mixture. Sprinkle the rest of the cornmeal mixture on top, and drizzle olive oil over the top (to help with browning). Bake for 25-30 minutes, until the top is crusty, and the inside has cooked all the way through.